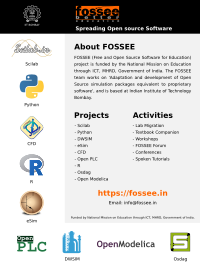 Details The FOSSEE team at IIT Bombay had taken up the initiative of promoting FOSS (Free and Open Source Software) for education. We had organized a one day workshop on Oscad, a free and open source Electronic Design Automation (EDA) tool for breadboarding, circuit design, simulation and PCB design. Oscad has been developed at IIT Bombay.